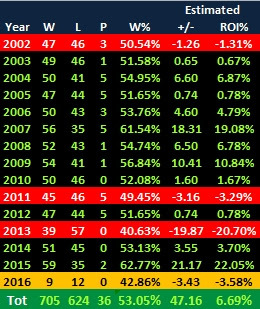 While the 2016 season has had just 21 Division games so far, the away team has a record against the spread (ATS) of 9-12, but for the full 2015 season their record in the 96 Division games was an impressive 59-35-2. If we use Pinnacle's 1.952 as an average price, that works out at a very healthy 21.17 point profit, an ROI of 22%. Just three losing seasons of the 14 completed, and only 2013 could be considered a disaster. The next test for this system is tonight, with the Arizona Cardinals (-3.5) on the road at the San Francisco 49ers. Thanks to Martin for the suggestion. Being a Thursday night game, this rather neatly ties in with the second suggestion, for which the source wishes to remain anonymous. He tells me that coaches detest the Thursday night game which has recently become established, mostly because they prefer the routine of playing weekly on a Sunday, with a full seven days to prepare for the next game. While the Monday night football game reduces this to six days, it's been around for a long time, and at least Monday adjoins the weekend. Thursday doesn't, and so my anonymous source is convinced that with less time to prepare, coaches play with a 'vanilla offense' which results in low scoring games. "Back the Unders", he told me. I've seen worse suggestions, and although I do like a logical explanation, I do think this would be widely known if true, but I put it out there for your entertainment and consideration. 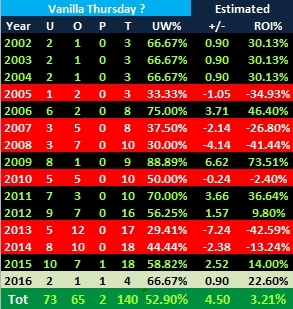 Some of you may be interested to know that I took a look at games on other days of the week, excluding play-off games, and found that every Tuesday and Wednesday game since 2002 went Under, while every Friday game went Over.